You don’t need to have someone called Alice in your wedding party to enjoy this wedding invitation but your guests will be in Wonderland when they receive this invitation. This is a very simple yet stylish design, resting on a love heart motif. There is a sense of subtlety to the invitation which should make it a great option for couples looking for a playful style and spirit when it comes to letting their guests know about their big day. The font carries on with the playful spirit, offering an informal style and the rounded letting provides an upbeat tone to the invitation. While the overall design will please couples looking to develop a playful mood with their invitation, there is a sense of fun and almost frivolity with this invitation, which makes it a perfect option for brides and grooms that enjoy the lighter side of life. 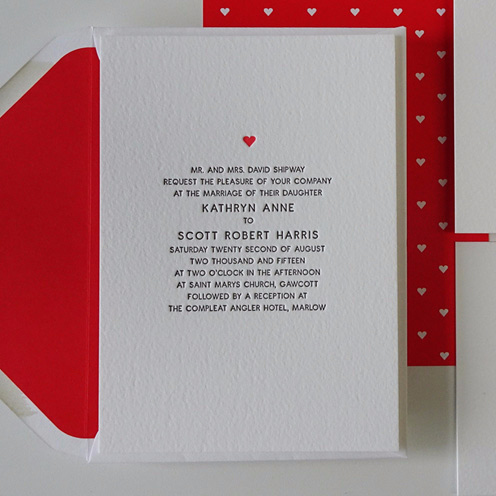 The striking red surroundings of the card combines well with the crisp white display and the stamped hot foil of the lettering ensures that this is a wedding invitation that is as delightful to touch as it is to look at. When it comes to having a wedding invitation that catches the eye as well as the imagination, the Alice wedding invitation from Strawberry Sorbet is likely to provide you with everything you could hope for in the run-up to the big day. Any couple looking to add that certain something to the invitation will be delighted with the array of hand-made ribbons, tags and belly bands that can be ordered as accessories for this wedding invitation. When it comes to providing a great look and style with your wedding invitation, the Alice wedding invitation stands apart from many of its peers.